Nominate for the "rural oscars"
THE Countryside Alliance Awards are asking the public to nominate their rural heroes. The awards, were set up to applaud those who go the extra mile and help sustain life and business in the countryside. The Leicestershire Rural Partnership (LRP) invites your input into the scheduled refresh of the Leicestershire Rural Strategy, 2007-14 - based on the principles of reduce, refocus and revise. The current Strategy was launched by Lord Haskins and Mrs Lesley Pendleton at our Bi-Annual Conference in 2007. It has since been successfully used to support funding bids for both our Vibrant Villages and INSPIRE Leicestershire programmes. It has also formed the backbone to all our consultation responses at a local, regional and national level. As part of the consultation on the revised Strategy – revised as the Leicestershire Rural Framework, 2011-14 – we will host a Forum event on 23rd November 2010 at Kibworth Grammar School Hall, Kibworth Beauchamp (12-4pm - tbc). Reduced public sector funding and changes to governance structures will mean that it is essential we have a Framework which clearly outlines what we want to achieve for Leicestershire's rural communities and businesses, and how we will ensure this. Mrs Lesley Pendleton, Chairman of the Leicestershire Rural Partnership, commented, "I strongly urge as many people and organisations with an interest in rural Leicestershire to attend this event. There is a real danger that as funding is reduced, those living in more sparsely populated areas will be hit hardest. A refreshed Leicestershire Rural Framework which clearly articulates the needs and aspirations of rural Leicestershire will be the necessary instrument to ensure our effectiveness at influencing policy and delivery". Full details of the event are currently being finalised. The agenda and booking form will be published through the LRP's website shortly. For further information in the meantime, please e-mail:matthew.kempson@leics.gov.uk or ring him on tel: 0116 305 6179. Former Brooksby College student Andrew Rees, from Gauldby Lodge Farm near Billesdon, was last night crowned Young Farmer of the Year at the 2010 Farmers Weekly Awards held at the Grosvenor House Hotel in London. The Awards' aim is to recognise innovation and achievement among individual farmers as well as celebrate excellence within the industry. Another local farmer, Jan McCourt of Northfield Farm at Cold Overton, was also recognised by coming runner up in the Local Food Farmer of the Year category. 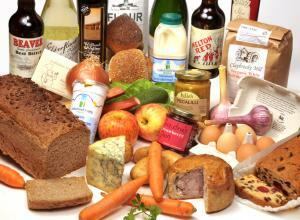 Ardent local food shoppers will be pleased to know that the NEW online Leicestershire Food and Drink Directory has just been launched. With a wide range of farmshops, delicatessens and local producers it's the ideal way to find your freshest local produce. Produced by Leicestershire Food Links, the directory also includes details of pubs, restaurants and accommodation that serve local food. 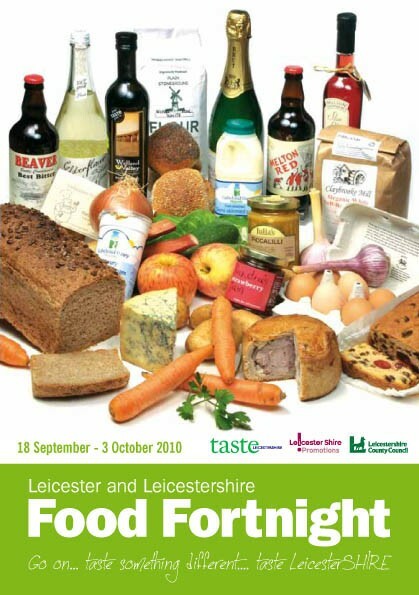 Every effort has been made to make the directory as up to date as possible, however, Leicestershire Food Links are always eager to hear from any new producers or retailers that would like to be added to the next edition. 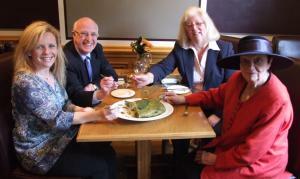 The Woodhouse restaurant in Woodhouse Eaves has been named as the winner of the Best Leicestershire Menu. The award, run by Leicester Shire Promotions, was announced at the East Midlands Food Festival at Brooksby Hall, near Melton Mowbray. Held in conjunction with the Leicester and Leicestershire Food Fortnight other shortlisted entries including Horseshoe Cottage Farm B&B, Belvoir B&B, Manor House farm tea rooms and Scalford Hall. Aimed at local restaurants, the Best Leicestershire Menu looked for examples of fixed price menus, celebrating the best local produce. 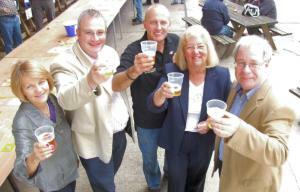 LRP Chairman, Lesley Pendleton, was one of the invited guests at yesterday's Quorn Bacon Roll Day. Residents had been encouraged to create their own version of this local dish which has nothing in common with bacon sandwiches or meat substitutes but is in fact a kind of savoury suet pudding containing herbs, onions and bacon. Eight different Quorn Bacon Rolls competed at the Quorn Exchange Restaurant and were judged by a panel on presentation, texture and taste. After much deliberation, and probably very full stomachs, local resident, Angela Bishop was announced the winner. The Quorn Bacon Roll Day is just one of over 70 events which are being held over both the City and County as part of the Leicester and Leicestershire Food Fortnight which culminates this weekend with the East Midlands Food & Drink Festival at Brooksby Hall near Melton Mowbray. LRP Chairman, Lesley Pendleton and Richard Windley, the Leicestershire & Rutland Rural Housing Enabler, were both interviewed about affordable rural housing and the sustainability of rural settlements for the Sunday 19th September edition of The Politics Show. The interview starts at 38mins 40 seconds into the programme. A packed feast of events celebrating local food starts today with the launch of the Leicester & Leicestershire Food Fortnight (LLFF). From vineyard tours to specialist cookery schools, gourmet evenings to tasting sessions the fortnight has something for everyone and this year the event organisers are hoping to set new records for the number of people involved. LLFF runs from Saturday 18th September and culminates with the East Midlands Food Festival at Brooksby Hall, near Melton Mowbray on Saturday and Sunday the 2nd and 3rd October. LLFF is being delivered by the Leicestershire Rural Partnership, Leicestershire County Council, Leicestershire Food Links with the support of Leicester City Council, Leicester Market and Melton Mowbray Food Partnership. Leicestershire businesses will benefit from an new service that offers free advice and grants or specialist consultancy to Small to Medium sized Enterprises (SMEs) to improve their resource efficiency. Trying to stay ahead of the game, businesses continually strive to be more competitive and the Improving Your Resource Efficiency (IYRE) service is a simple solution to help your business reduce expenditure and increase profits. The IYRE service, can provide free impartial advice for your business and suggest next steps to make improvements; and to help with any costs a minimum grant of £1000 or 2-days specialist consultancy is available to all eligible SMEs. For more information visit www.energyagency.co.uk or telephone 0116 299 5133.